When you shoot 50 percent from 3-point range, you’re going to win a lot of games. The Clippers did just that Wednesday, making 15 of 30 from beyond the arc in their 122-117 victory at Charlotte. 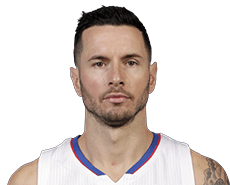 J.J. Redick was the biggest weapon, scoring 26 points while making 5 of 6 from long-distance, 8 of 14 overall. The Clippers (20-13) are 3-0 without Griffin, who is out with a partially torn quad tendon. This entry was posted in Results and tagged Blake Griffin, Charlotte Hornets, Cole Aldrich, DeAndre Jordan, J.J. Redick, Los Angeles Clippers by Robert Morales. Bookmark the permalink.